The Dragon Prince panel at New York Comic Con revealed some breaking news and fun facts for the future of the Netflix animated series. Wonderstorm community manager Danika Harrod led the panel, with The Dragon Prince co-creators Aaron Ehasz and Justin Richmond, executive producer Giancarlo Volpe, and actors Jack De Sean and Paula Burrows providing commentary. Kicking off with animatics and concluding with hilarious trivia, The Dragon Prince panel held plenty of laughs, and some welcome surprises for fans. Here’s what we learned! ‘The Dragon Prince’ is renewed for season 2! After teasing an end-credits picture of the mysterious dragon mirror, a reaching hand with several fingers extended trapped inside, Aaron Ehasz announced the good news: The Dragon Prince season 2 will be coming to Netflix in 2019. “This is a big story, we have a lot more to tell,” he said, revealing an exciting piece of art to tease the new season. 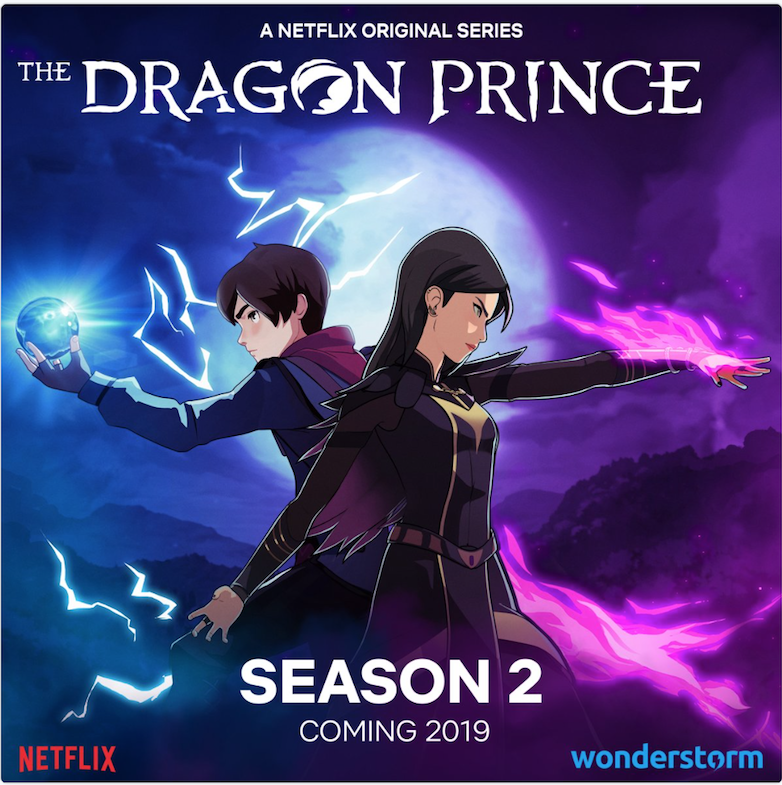 While we can’t glean too much from the image, it seems clear that The Dragon Prince season 2 will feature a clash of Claudia and Callum’s magical powers. 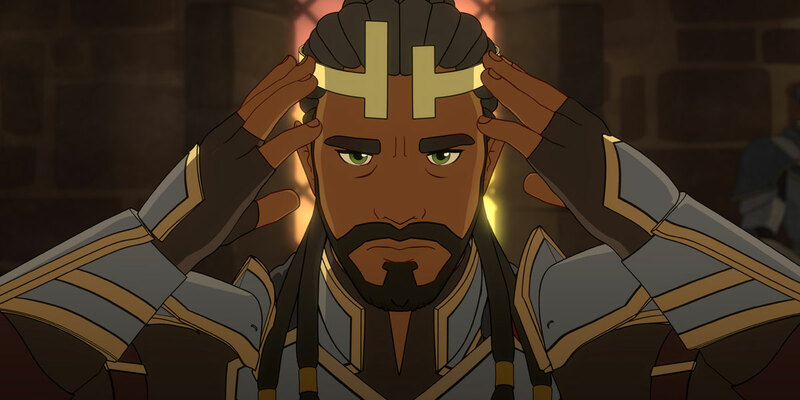 Executive Producer Giancarlo Volpe shared that decision makers were concerned that the opening of The Dragon Prince would be too dark to attract younger viewers. Volpe polled the crowd, which resoundingly rejected the idea, but the show’s creators were ready with a backup just in case. Early in the panel, they revealed a re-dubbed version of the epically mythological opening, featuring hilariously dumbed-down language (which the creators jokingly called “a fan friendlier tone”). Narrated by Soren, everyone’s favorite meathead, the opening was also intercut with the young lord doing his signature pushups. Speaking to the moody nature of parts of the series, Volpe noted that it was important “not to alienate kids” with overly heavy themes. “But I think there’s also an importance to weight and real gravity with the show,” he said, noting that the contrast between light and darkness was crucial to their concept of The Dragon Prince. After thanking the audience for their palpable enthusiasm, Ehasz revealed that The Dragon Prince came about in no small part due to sheer grit from its creative team. Many members went to work based on faith in the story, working without salaries or health care. Early episodes were written before production had formally begun, and Volpe storyboarded the first three episodes singlehandedly, with few designs to work from. It was clear that the profound fan response, with which The Dragon Prince frequently engages, was a gratifying reward for that faith and investment. 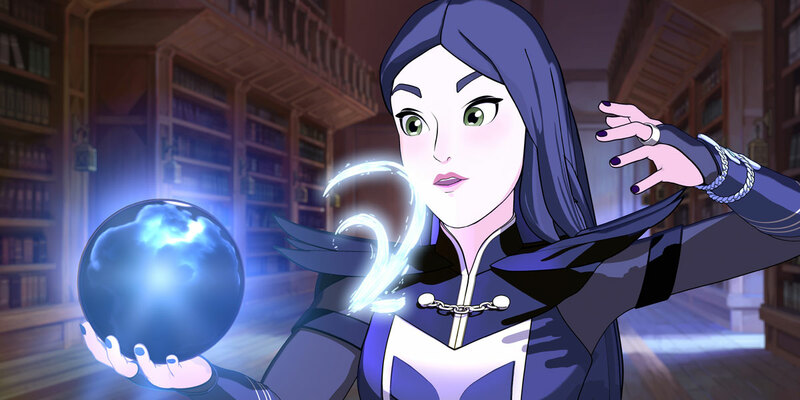 The Dragon Prince creators noted that diversity, particularly in the characters of General Amaya and King Harrow, was deeply important to their concept of the series. Co-creator Justin Richmond added that a lot of thought went into portraying Amaya’s voice as a non-speaking character. The choice was made to provide the freckly Commander Gren to convey her words, but the writers were careful to make space for Amaya to speak on her own, as she does in the moving scene before her sister’s grave. Volpe also noted that creators of fantasy have a misplaced instinct to echo a specific concept of a long-ago England. “But it’s fantasy,” he said. “You can do whatever you want!” This awareness led to the creation of King Harrow, a person of color who thoroughly rocks a detailed mane of dreadlocks, a unique character presentation in most animated shows. When asked about the exciting announcement of the new live-action Avatar: The Last Airbender series coming to Netflix, Ehasz, who worked on the animated show, expressed excitement for the new development. Asked about their favorite scenes from The Dragon Prince season 1, the panelists provided a gamut of answers. Danika Harrod gushed about the early scene of Viren waking Harrow (“This is my thing,” she declared). Paula Burrows enjoyed Runaan and the affable Gren in the dungeon, while Volpe chose Runaan’s dramatic act on the castle balcony. De Sena loved Callum and Harrow’s moving goodbye scene, and also shared Ehasz’s love for Amaya’s moving moments at the statue of her sister. Ehasz also mentioned the tense moments between Callum and Rayla on the frozen lake as a personal favorite. As for Richmond? Well, he settled on the season’s singular fart joke, which came (naturally) courtesy of Claudia. The Dragon Prince is currently streaming on Netflix. Are you excited to tune in to ‘The Dragon Prince’ season 2?